Maximize your living space with the new DVD wall shelf by Sonax. Featuring smooth curved edges this sleek Black tempered glass shelf is the ideal size for your DVD player or PVR. Adjustable shelf height and a convenient wire management base make this space saving design the simple solution to your home entertainment needs. Modernize your living space with this contemporary design by Sonax. Versatility and functionality are pillars in the design plans of this bookshelf. Use this open-concept shelf against a wall or float it as a room divider. Not just for books or magazines, this shelf provides ample space for vases, statuettes, trophies and more. The sleek, dark finish reflects luxury and distinction. Available in black. Grabcessories 2-in-1 Grab Bars & Towel Shelf provides beauty, fall prevention, towel & accessory storage in one product. Beautifully designed with graceful curves and disguised to blend with any bathroom dicor, the fixture can be mounted where you need safe towel storage and retrieval the most, preventing falls in another fall risk zone in the bathroom storing and retrieving dry towels. This ADA compliant, non-corrosive Stainless Steel Grab Bar has a Brushed Nickel finish and holds up to 500 lbs. The Shelf is made from tempered glass, also known as safety-glass. All LiveSafe Hollow Wall Anchors (4) and Stud Mount Hardware are included so you can mount Grabcessories anywhere you like on your wall. FINALLY, beauty, safety, affordability and independent living combined! Grabcessories 2-in-1 Grab Bars & Towel Shelf provides beauty, fall prevention, towel & accessory storage in one product. Beautifully designed with graceful curves and disguised to blend with any bathroom dicor, the fixture can be mounted where you need safe towel storage and retrieval the most, preventing falls in another fall risk zone in the bathroom storing and retrieving dry towels. This ADA compliant, non-corrosive Stainless Steel Grab Bar has a Polished Chrome finish and holds up to 500 lbs. The Shelf is made from tempered glass, also known as safety-glass. All LiveSafe Hollow Wall Anchors (4) and Stud Mount Hardware are included so you can mount Grabcessories anywhere you like on your wall. FINALLY, beauty, safety, affordability and independent living combined! The Homestar Wall mounted coat rack is ideal for hanging your bags, scarfs, dog leashes - anything you may need as you're running out the door. With four hooks and a shelf your front entrance way or mud room can be neat, clean and organized the way you have always wanted. C-701-SCM DVD Wall Shelf Maximize your living space with the new DVD wall shelf by Sonax. 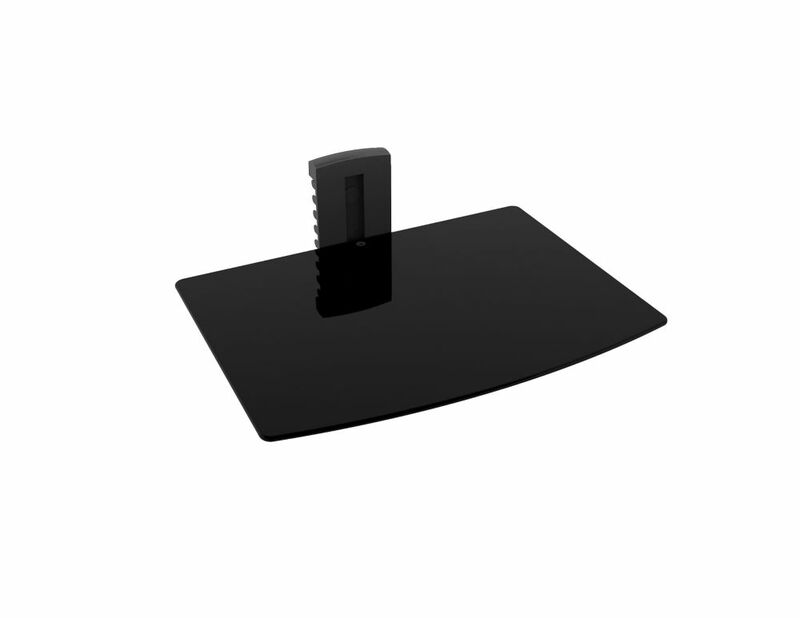 Featuring smooth curved edges this sleek Black tempered glass shelf is the ideal size for your DVD player or PVR. Adjustable shelf height and a convenient wire management base make this space saving design the simple solution to your home entertainment needs. Modernize your living space with this contemporary design by Sonax. C-701-SCM DVD Wall Shelf is rated 4.5 out of 5 by 2. Rated 4 out of 5 by MelMac from Exactly as Ordered Am happy with this transaction. Item is as described, item was shipped quickly and in perfect condition. Rated 5 out of 5 by Fran from Excellent Bought this to accommodate my HD box. Works perfect and looks great. Was exactly as described. Easy to install.